Tips to help you start cases! Experiencing an issue with SmileStream? Report it here. Input & Analyze the Records Ceph trace, model measure and select a treatment plan within SmileStream (watch tutorials). Do as much as you can to benefit the most…don’t worry, if you’re not 100% sure, the instructor will correct you! As a student of our Comprehensive Orthodontic series, you qualify to get a free case at the start of your training. Take advantage of your free case and set yourself up for success from the beginning! Each new student may submit one case for free by Seminar 4 or Module 2. If you have any trouble securing your case by then, please contact us for additional support. 1. If you’re not in the Orthodontic section already, click “Clinical” in the left menu then click “Open Patient” and select the patient you’d like to submit. 2. Click the “Consulting” icon (the head in the right menu, like below) to get into the Consulting feature. Feel free to add a note with details that will be helpful to your mentor. 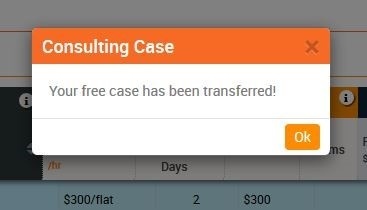 Once you click “Send Free Case” you should see this confirmation pop up. This means that your case has been sent to your instructor to complete within the guaranteed time listed. 5. You can check the status of your case within the Consulting tab in the “Open Patient” section. If the consultant is still working on the case you’ll see the due date listed. You will get an email once your mentor has returned the case back to you. Find the returned case via a link from that email or within the “Open Patient” section (make sure that you’re in the Consulting tab). 6. Review your mentor’s changes and suggested treatment plan. Since your free case is through the mentoring service, you can later get follow up mentoring or clarification by submitting a direct message by clicking the envelope icon next to your returned case. Once your patient accepts your treatment plan, it’s time to order. Select your treatment plan, appliances and bands and go to your shopping cart to check out. (If you need help with this, watch Instructions on How to Order from 38:37). In your shopping cart, you’ll notice a store credit listed (like below). You’ll receive up to US$200 off this order. After you finish placing your order and officially check out, you will get a thank you message, similar to this. You will also receive an automatic email upon submission with your order details and total. As you start your first cases, please don’t hesitate to contact us for any guidance and support. Your free case supply credit is applied automatically to your next purchase on SmileStream. Although the free case is typically used for your free case’s materials, your credit can be for any type of purchase on SmileStream (including supplies, consulting and mentoring), and is automatically deducted off your next purchase. You will get up to US$200 off your next order. If your order is less than US$200, the remainder will remain on your account for your next purchase. If your order is more than US$200, you will be charged the balance. You will see the store credit in your shopping cart and check-out. Your total order (and store credit listed) may adjust once you confirm or update your shipping address during the check-out process. What if my patient doesn’t accept treatment? In the rare occurrence that your patient doesn’t accept treatment to your free mentor case, please contact us. We may be able to transfer your free mentoring to another patient so you can take full advantage of the program. Please note that you will have to pay for the initial case consulting for the patient that didn’t accept treatment, as an instructor spent time working with you. What do I do if I don’t understand my consulting plan from the instructor, or do not like it? As with all consulting and mentoring cases, please send your follow up questions to the initial instructor used so that you get a streamlined plan and do not incur extra charges. All consulting and mentoring services are recommendations from an experienced and trained clinician on how they would treat that case efficiently. This service can be a wonderful learning tool, especially since consultants reply back with a general concept of the treatment plan and suggestions. You are welcome to clarify any instructions that are confusing by messaging the consultant back. But please note that consultants are not expected to teach you concepts and principles with this service. You can reference the seminar content or videos to review those concepts, or ask on the Collaborate section to learn orthodontic concepts. Contact info@posortho.net if you need help finding where to review specific concepts or to attend a live class. If ever you have concerns about your instructor diagnosis, please send a quick message to your instructor to clarify. Or contact Educational Director Dr. David Dana at danadds@aol.com. Please keep in mind that there are many ways to treat the same case properly, so we suggest that you write any preferences in your notes before sending. However, we want to make sure you have the best plan for your patient and not all preferences can be accommodated.